Minibar is another one of those anomalies afforded to the listener by the global village. They are a British band that plays American roots music laced with English pop. As a matter of fact, it has been reported that Minibar was on their way back to England just before signing with Universal. The deal kept them on the west coast and Road Movies was recorded. The opening track from the album and first single is the most characteristic of the Minibar sound. "Holiday From Myself" is a pop song complete with vocal harmonies. It sounds like Matthew Sweet straddling the pop and country veins on Girlfriend. What follows is a note for note cover of the unreleased Whiskeytown song, "Choked Up". Having heard the Whiskeytown version, it is hard to decide which is better. 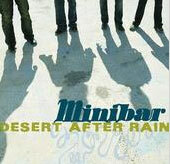 However, the Minibar version fits the band's style much better than Whiskeytown's. The rest of the album is an enjoyable if regular batch of songs. They all appear pretty ready for AAA radio and would be rather difficult to discern from the Wallflowers. A sweet if not entirely satisfying debut.